As it is January and this month is largely taken up by one star sign in particular we decided to begin with Capricorn - the goat. This first look comes from Emma whose blog is All The Pretty Things Emma is a fellow Irish blogger so I'm really happy to have her as part of the tag. Isn't her look stunning?! Here is what Emma said inspired her to create this Capricorn look of hers - "As Capricorn is usually thought to be half goat, half fish, I decided to do a white (the goat) fading to blue (for the fish). The eyeliner flick is inspired by the horns of a goat also". As for what products Emma used to create the look, all colours used were from Urban Decay 'Preen' and 'Dangerous' palettes. Sarah is a London based blogger. I was amazed when I received her pictures, this look, for me, totally embodies the Capricorn goat look! 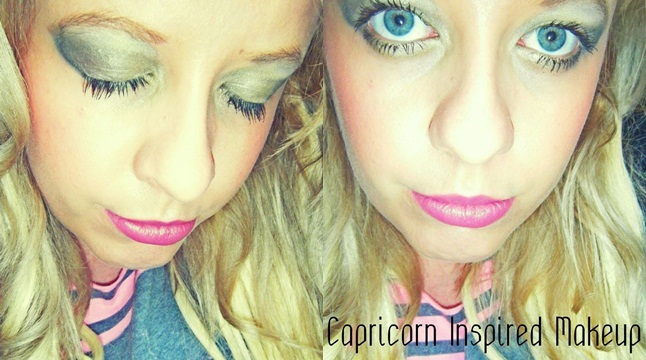 When asked what inspired her to create this look to demonstrate Capricorn Sarah said - "What inspired me what the strong features of the Capricorn and how the light hits its nose and creates a dramatic shadow around it. I wanted to try and show the horns, so tried to use my eyebrows and extend them up. The reason for hint of blue on the cheeks is the fish half of the goat as it is depicted in drawings and such. To add a watery effect almost but not over do it". The products Sarah used were - Urban Decay NAKED palette, Sublime De Chanel Mascara, Barry M Electric Blue eye shadow loose powder, 45 YSL lipstick, DIOR Rose Diamond highlighter and Eyelure Eyelashes. The last look comes from little old me and if you didn't know, this is my blog! Capricorn is an Earth sign so I decided to go for green eye shadows in three different shades as for me green is the colour of the Earth. I highlighted my brow bone with a white shadow to make the look really stand out. I then used a lighter green shade with a yellow hue in it to frame the inner eye, blending it outwards with a darker green hue. I then used a darker green shimmer shadow to contour the outer eyelid to create a subtle horn effect, the symbol of Capricorn. I used a purple/pink lipstick as purple and brown are the symbol colours of the Capricorn star sign. As for products used, I used L'Oreal Lumi Magique foundation to create a dewy look. I highlighted my cheekbones with an Estee Lauder peach toned blush with gold flicks running through it. I used MAC eye brow pencil in 'Dirty Blonde'. For the eyes I used the white and green shades from my GOSH palette and MAC limited edition eye shadow in 'Smutty Green' to create the darker contour. I used Benefit 'They're Real!' mascara. I finished the look by using Rimmel lipstick in 'One of a Kind'. I love how everyone interpreted the star sign of Capricorn in a different way! These tags really allow for creativity and everyones own personal take on what something symbolises to them, that's why I love taking part in makeup tags. 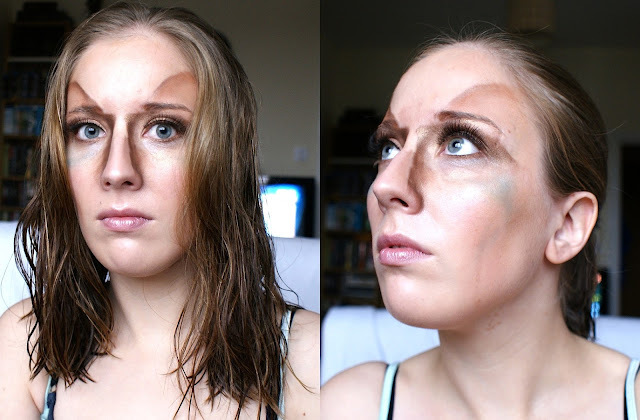 Thanks so much to Emma and Sarah for taking part and I hope they'll take part in next months Aquarius inspired makeup feature. Remember, if you'd like to join us then please email me for details. It's really fun creating these looks.